Returning players like LaKeisha Eaddy and Kristen McCarthy and freshman Victoria Macaulay hope to lead the women back to the NCAA Tournament. JOHN BIRK TTN Coach Tonya Cardoza is counting on freshman center Victoria Macaulay to replace the inside tandem of Shenita Landry and Shanea Cotton on an otherwise experienced team that made if to the NCAA Tournament last season before losing to Florida in the first round. With the return of a couple key players and the addition of an impressive recruiting class, coach Tonya Cardoza and the women’s basketball team are primed to make some noise this season. Last year, in Cardoza’s first as coach, the Owls went 21-10 and captured an NCAA Tournament berth. However, the Cherry and White lost two forwards to graduation – leading scorer Shenita Landry and Shanea Cotton. In order for Temple to be successful, players like senior guard LaKeisha Eaddy and sophomore forward Kristen McCarthy need to help shoulder the load. Eaddy averaged 11.1 points and 5.3 assists last year, her first season as a point guard. 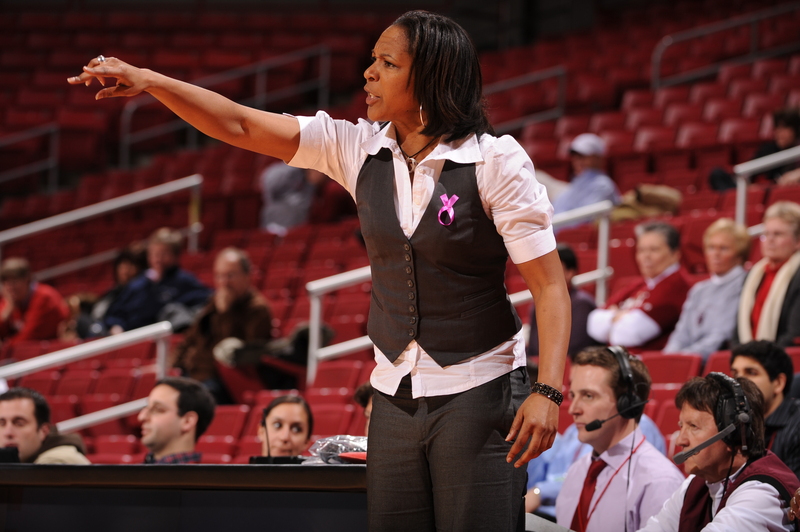 Despite her relative success at the new position, Eaddy said she should run the point even better this season. For all the experience Eaddy brings to the table, McCarthy brings an equal amount of youth. As a freshman last year, McCarthy started 20 of 31 games and averaged 8.6 points per game and 4.3 rebounds per game. McCarthy’s immediate impact garnered her All Atlantic Ten Rookie Team and Big 5 Rookie of the Year honors. Given her aptitude at scoring in bunches, McCarthy will likely be asked to absorb some of the scoring loss that the departure of Landry created. Down low, freshman Victoria Macaulay will likely start the season at center. Macaulay, a 6-foot-3-inch player from Staten Island, N.Y., brings a physical presence to the Temple frontcourt that few in the A-10 can match. While Macaulay brings size to the paint, playing in the post will be a learning experience all year for the Owls. With junior center Marli Bennett the only returning big man with significant experience, numerous players will have to step up, Cardoza said. Having an athletic team will help make up for some of the growing pains down low, Cardoza said. The Cherry and White have an impressive out-of-conference schedule this year, with the Duke Blue Devils, Auburn Tigers, Illinois Fighting Illini and Villanova Wildcats all coming to North Broad Street. Throw in trips to East Brunswick, N.J., to play Rutgers and to Tallahassee, Fla., to face Florida State, as well as the always crucial Xavier game, and the Owls will have plenty of opportunities to prove themselves this year.